MINNEAPOLIS - Manny Ramírez, sore right hamstring and all, stood in the batter's box. Two outs in the ninth, down one run, Coco Crisp on second base. This was it, right? This was where pinch-hitter Ramírez would bring the Red Sox back from the depths of a loss once again. His grounder to shortstop didn't quite get it done, Adam Everett winging the ball to Justin Morneau for the out at first base. But the fact that the Red Sox even had a chance, now that was the surprising part. Because when Tim Wakefield left the game after just 2 2/3 innings, having given up seven runs (six earned), it looked like all those Twins mothers, the ones who lined up along the third-base line to be announced before the game, would get a relaxing night watching their sons take another from the Red Sox. Which they did eventually, winning, 9-8, in front of 26,511 pink-clad fans in the Metrodome. But not without a racing heartbeat or two. "That's a hard way to play the game," Sox manager Terry Francona said. "That's about as exciting a game as you can have and not win. I don't like to find fault anyway, but there's no fault [in not getting the final run across in the ninth]. "We gave ourselves a chance in a game that didn't look like, I think, a lot of teams have a chance." They were put there, though, by the same starter who turned in a virtuoso performance last Tuesday night against the big bats of the Tigers. One start after Wakefield came within an inning of a complete-game shutout, he had his shortest outing since he threw just two innings at Tampa Bay Sept. 28, 2003. It was only his third start in 243 tries (since July of 1997) in which he pitched fewer than three innings. 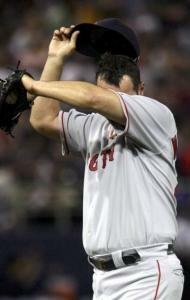 "I came back to the dugout one inning just shocked at some of the pitches they were hitting," catcher Kevin Cash said. " 'Cause they were pitches if they weren't hit, I don't know if I was going to catch them." Two homers by the home run-shy Twins - they would add another later - put Wakefield and the Sox in that hole, the five second-inning runs coming on home runs by Craig Monroe (his third in 20 at-bats off the knuckleballer) and Everett (35 career HRs in eight major league seasons before last night). Monroe added his second off Mike Timlin in the seventh, making it three for a team that was last in the American League with 17 entering last night. Not only had Wakefield stymied the Tigers' offense in that Tuesday start, in which he allowed just two hits, walked none, and struck out six, but he was pitching in the Metrodome. And pitching indoors usually is a good thing for the knuckleballer. Wakefield is 7-3 with a 3.95 ERA in Minnesota, 13-4 with a 4.00 ERA against the Twins home and away. "Obviously I didn't pitch very well," Wakefield said. "I made a good pitch to Monroe for the three-run homer. Made a bad pitch to Everett for the two-run homer. Pretty much after that I tried to scrape it together and keep us in the game as long as possible." That turned out to be as late as the ninth. After Wakefield exited, the Sox got contributions from the little-used Julian Tavarez, David Aardsma, Timlin, and Javier Lopez, with two more runs coming home (an unearned one off Tavarez and the homer off Timlin). They went into the ninth down by three, 9-6, having climbed back with one in the third, three in the fourth, and two more in the seventh - with Twins closer Joe Nathan on the mound. With one out, Kevin Youkilis hit an infield single, which was followed by a single up the middle by Mike Lowell. J.D. Drew's double on a ball misjudged by center fielder Carlos Gomez scored one run, the first off Nathan in a save situation this season, and put runners on second and third. That put Crisp, who already had a triple and a two-run homer, his second in as many days, at the plate down two runs. His ball hit off Nathan's glove, popped up, and landed near the closer, who flipped to Mike Lamb at third to nab Drew, with Lowell scoring. "My first reaction, I froze, seeing the ball kick up in the air," Drew said. "I felt like it was coming at me. It was just one of those circumstances, you know? I don't know if I should say bad read, just unfortunate read." That brought up Ramírez. Crisp stole second with Ramírez at the plate, putting the tying run in scoring position. But that groundout set the Red Sox down. It was, in the end, simply too far to come back. Too much given up by Wakefield, too big of a hole, for the offense to overcome. Perhaps a good night for those Twins mothers. For Wakefield? Not quite the same feeling. "One of those nights," Wakefield said, "I'd like to forget."